“I Am a Girl” from Christian Faith Publishing author Shaunice Dedner is a heartwarming account on the importance and purpose of a woman in a world full of bigotry and condescending mindset. “I Am a Girl”: a charming narrative that opens a sensible discussion on the essence of femininity in the society. “I Am a Girl” is the creation of published author, Shaunice Dedner, a seventeen-year-old senior at the Cherokee Trail High School and a recipient of numerous awards such as the Aurora Scholar Award and the President’s Award for Educational Excellence; she is also a writer, public speaker, and advocate for women and children’s rights. “I am a girl, clothed in grace (Colossians 3:12). I am girl, in humility I walk (Ephesians 4:2). Published by Christian Faith Publishing, Shaunice Dedner’s new book is both illuminating and thought-provoking of today’s morality and impact of women in the community. There is a challenge, especially to the women, to live and do things with utmost grace under God’s guidance. The demeaning nature of masculine superiority is dimming the shine of female capability. Now is the time to step up and rediscover what it means to be a daughter of the Almighty Father. View a synopsis of “I Am a Girl” on YouTube. 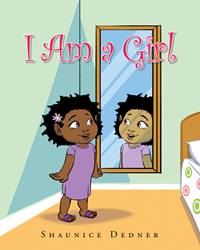 Consumers can purchase“I Am a Girl” at traditional brick & mortar bookstores, or online at Amazon.com, Apple iTunes store, Kobo, or Barnes and Noble. For additional information or inquiries about I Am a Girl”, contact the Christian Faith Publishing media department at 866-554-0919.